The Arctic northern and southern lights, also known as Auroras, which mesmerise tourists from all over the world, might have a sinister side to them. A recent study, published in the International Journal of Astrobiology, has found a strong correlation between the solar geomagnetic storms that are responsible for auroras and the beaching of whales in the region. Twenty-nine sperm whales, mostly young, had beached across the North Sea, a region east of Britain and south of Norway, in early 2016. Necropsies performed on the whales at the time had found them to be healthy and well nourished, baffling researchers. The cause of this incident had remained a mystery until the present study conducted by a group from the University of Kiel in Germany. 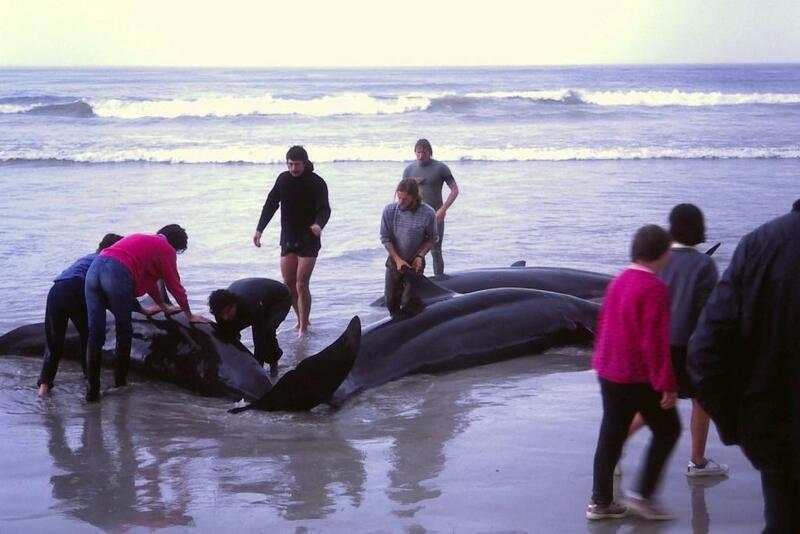 Mass beaching of whales is a global phenomenon but the causes have eluded researchers for long. With the present research they hope to close in on a possibility. The study details that young sperm whales first stay in the warm waters of lower latitudes of the Atlantic Ocean with their mothers. But on attaining maturity they form ‘bachelor groups’ and migrate north. The seasonal route of these migrating sperm whales does not go through the North Sea. Usually, they travel along the western coast of the British Isles, choosing this route as they are wary of shallow waters and the whales’ favorite prey, squids, are unavailable in the North Sea region. The navigation system of whales is based on magneto-reception similar to migrating birds, bats and butterflies. These animals find their sense of direction with the help of the Earth’s magnetic field. The researchers suggest that the magnetic mountains, which are regions of stronger magnetic field than nearby areas, prevent whales from getting diverted to the North Sea. They have found that the geomagnetic storms mould these magnetic mountains and disorient the whales, possibly diverting them to the North Sea. Once in shallow waters, the animals get trapped and eventually beached, creating a gory sight. The study also found that the younger whales were more prone to being affected by these storms. The more mature whales can manage small disruptions and can shift to an alternative, more effective system of navigation to maneouvre through a major shift in the local magnetic structures. The study zeroed in on two specific instances of geomagnetic storms, one of which occurred between December 31, 2015 and January 1, 2016 and could have been the cause of the North Sea stranding event. The researchers say that this storm was powerful enough to confuse the navigation systems of the whales and lead them astray. Studies have also found the movements of other species like homing pigeons and bees getting affected by such anomalies in magnetic field. Geomagnetic storms are a part of a wider phenomenon of space weather which also includes solar flares and are caused by the occasional explosions of particles on the surface of the Sun, called coronal mass ejections. These particles hurtle towards the Earth and collide with its magnetic field, altering its structure. This modification in the Earth’s magnetic field is responsible for the beautiful Auroras. But they can have adverse affects on human civilization as well, chief among which could be the possible failure of the power grid and a global power outage. A study published in early 2017 had estimated that a powerful geomagnetic storm event can cost the global economy around $40 billion. The present study, though significant, comes with a caveat. The research on the affect of geomagnetic storms on biological organisms is nascent and we have some way to go to establish beyond any reasonable doubt the relationship between these storms and disruption in the migration routes of whales and other animals.